substituting crushed fennel seeds for the pecans. 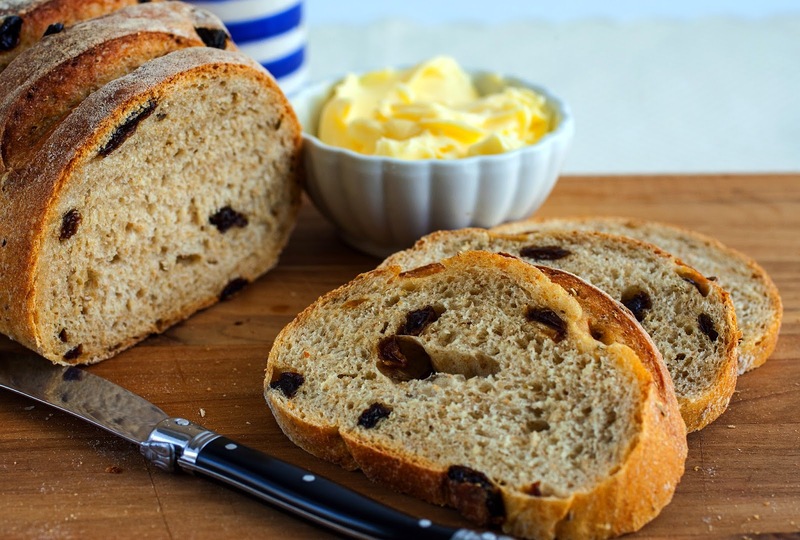 This recipe can easily be doubled, and the bread freezes well, as long as it’s well wrapped. 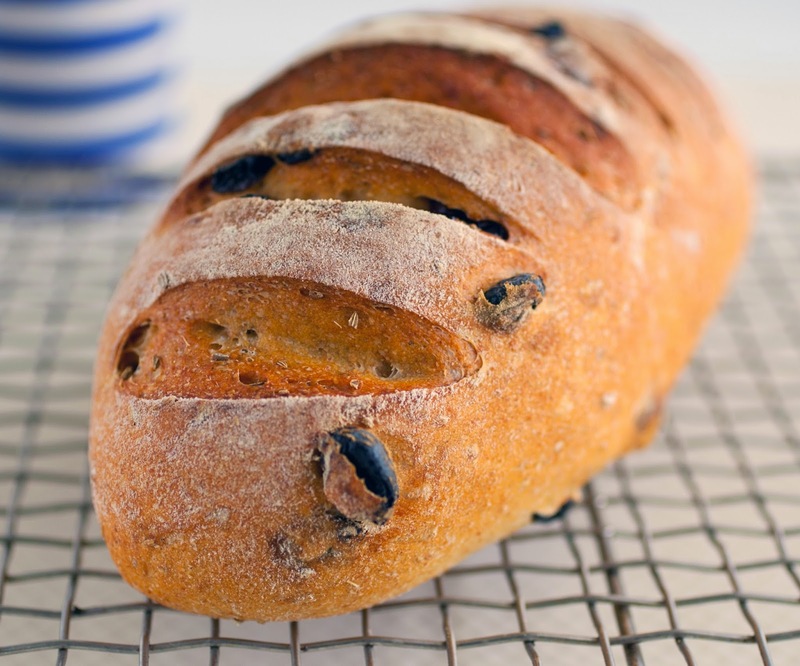 To do this loaf justice, serve it with a European-style butter, such as President or Plugra. It’s also wonderful toasted with just about everything. 1. 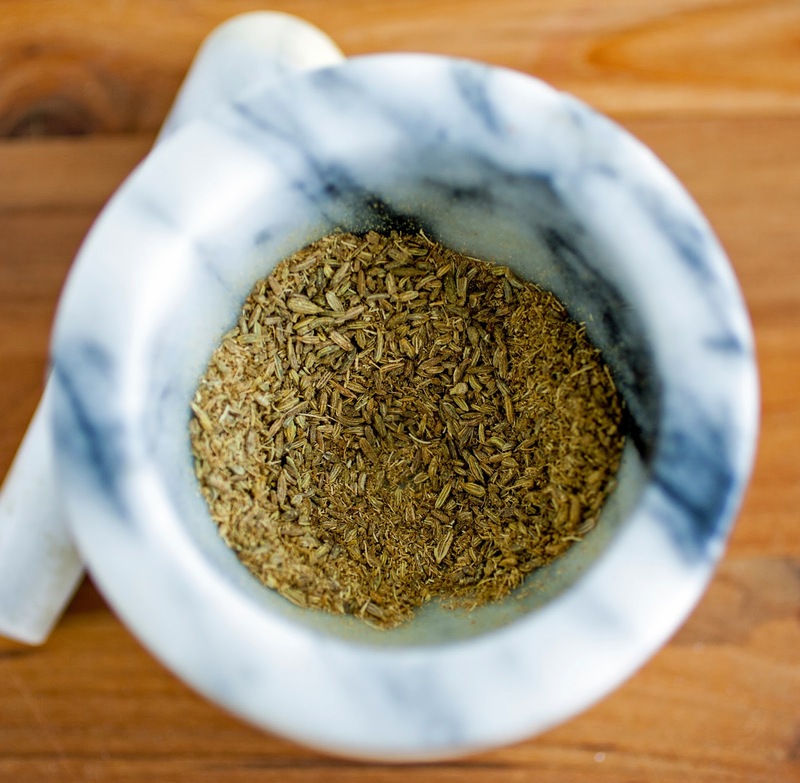 Place the fennel seeds in a small skillet over medium heat and cook, tossing frequently, until the seeds are fragrant and toasted. Cool the seeds, then crush them with a mortar and pestle. 2. In a medium bowl, stir together the bread flour, whole wheat flour, salt and crushed fennel seeds. 3. In a large bowl, combine the yeast and warm water. Allow to stand for 5 minutes, then stir to dissolve the yeast. Stir the flour mixture into the yeast mixture until a dough forms. 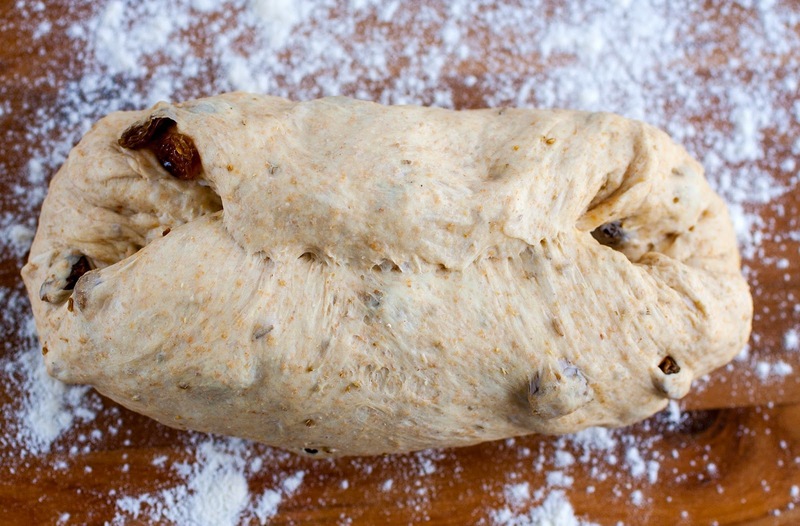 Knead gently with your hands a few times to form a smooth dough. Cover the bowl with a tea towel and let stand for 10 minutes. 4. 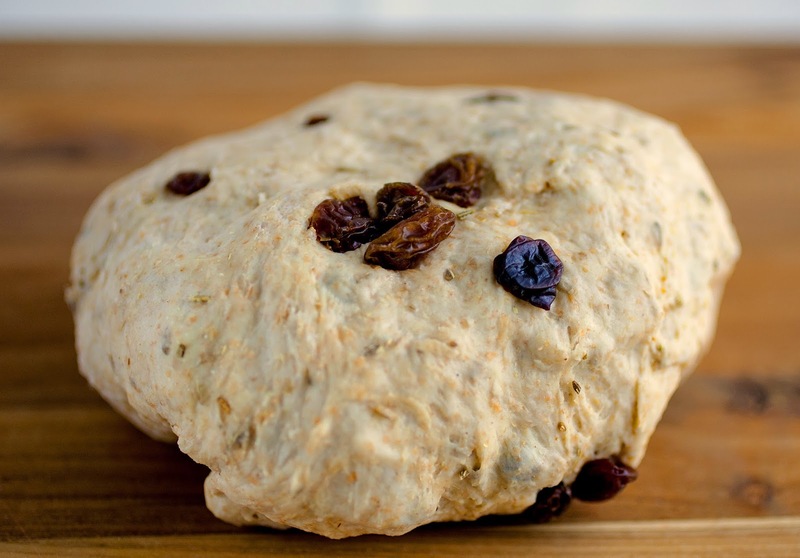 Add the raisins to the dough and press them lightly in with your hands. 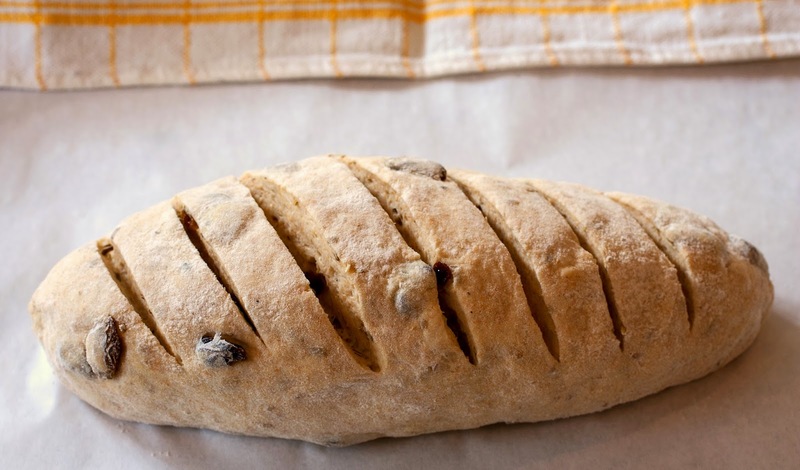 Use your fingers to stretch a portion of the dough out from the side and press it into the center. Turn the bowl slightly and repeat with another portion of the dough. Continue pulling and turning the dough 8 to 10 times, until the dough begins to resist. Turn the dough so that it is seam side dough, cover the bowl with the tea towel, and let rest for another 10 minutes. Repeat the pulling and resting process two more times. Pull the dough another 8 to 10 times, turn it seam side down, cover the bowl and allow to rest for 1 hour. 5. Punch the dough down to release the air and place it on a floured work surface. Fold one edge of the dough over into the middle, then fold the opposite edge over it. Roll the dough into log with tapered ends. Lightly sprinkle flour over the loaf and, using a sharp serrated knife, make shallow cuts diagonally over the top of the loaf, spacing them about an inch apart (I went a bit too deep with my cuts). Place the dough on a baking sheet, cover with the tea towel, and allow to rise 45 minutes, or until almost doubled in volume. Meanwhile, place a roasting pan on the bottom of the oven and preheat the oven to 475°F. Have a cup of cold water ready. 6. Remove the tea towel from the loaf and place it in the oven. Carefully pour the water into the roasting pan and lower the temperature to 400 degrees F; bake the bread for about 30 minutes, or until golden brown. To check if the loaf is ready, tap its bottom—it should sound hollow. Set the loaf on a wire rack and cool before slicing.